I have just received an urgent and grave request for prayers. A family is going through an extremely difficult time. Please say a prayer for them. Respecting their wishes, I will not go into detail on their problems; however, I do ask all of my readers to please pray for them. The motu proprio has been released! The next step is to start putting the Catholic faithful who want to assist at the Traditional Mass in touch with Catholic priests who want to say the Traditional Mass. Please fill out the form below with your contact information so we can help you make a connection. Please make sure to include your geographical information (it will be difficult to link you up with others in your area if you don't), as well as an email address so that you can be contacted when a match is found. Your information is private and will not be shared with anyone without your consent. Also, including your parish of registry will be very important for helping to connect people in the same parish who may be unaware of each other. Behold God is my helper, and the Lord is the protector of my soul: turn back the evils upon my enemies, and cut them off in Thy truth, O Lord my protector. -- (Ps. 53. 3). Save me, O God, by Thy Name, and deliver me in Thy strength. V.: Glory be to the Father -- Behold God is my helper . . . COLLECT - Let Thy merciful ears, O Lord, be open to the prayers of Thy suppliant people: and that Thou mayest grant their desire to those that seek, make them to ask such things as shall please Thee. Through our Lord Jesus Christ, Thy Son, who liveth and reigneth . . . Brethren, Let us not covet evil things, as they also coveted. Neither become ye idolaters, as some of them: as it is written "The people sat down to eat and drink, and rose up to play." Neither let us commit fornication, as some of them committed fornication, and there fell in one day three and twenty thousand. Neither let us tempt Christ, as some of them tempted, and perished by the serpents. Neither do you murmur, as some of them murmured, and were destroyed by the destroyer. Now all these things happened to them in figure, and they are written for our correction, upon whom the ends of the world are come. Wherefore he that thinketh himself to stand, let him take heed lest he fall. Let no temptation take hold on you, but such as is human: and God is faithful, who will not suffer you to be tempted above that which you are able; but will make also with temptation issue, that you may be able to bear it. O Lord, our Lord, how admirable is Thy Name in the whole earth! V.: For Thy magnificence is elevated above the heavens. At that time, when Jesus drew near to Jerusalem, seeing the city, He wept over it, saying: If thou also hadst known, and that in this thy day, the things that are to thy peace: but now they are hidden from thy eyes. For the days shall come upon thee, and thine enemies shall cast a trench about thee, and compass thee round, and straiten thee on every side; and beat thee flat to the ground, and thy children who are in thee; and they shall not leave in thee a stone upon a stone, because thou hast not known the time of thy visitation. And entering into the temple, He began to cast out them that sold therein, and them that bought, saying to them: It is written, "My house is a house of prayer." but you have made it a den of theives. And He was teaching daily in the temple. The justices of the Lord are right, rejoicing hearts, and His judgments sweeter than honey and the honey comb: for Thy servant keepeth them. SECRET - Grant to us, we beseech Thee, O Lord, that we may worthily frequent these Mysteries: for as often as the memorial of this Victim is celebrated, the work of our redemption is wrought. Through our Lord Jesus Christ, Thy Son, who liveth and reigneth with Thee in the unity of the Holy Ghost . . He that eateth My Flesh, and drinketh My Blood, abideth in Me, and I in him, saith the Lord. POST COMMUNION - May the communion of Thy Sacrament, we beseech Thee, O Lord, bring to us cleansing and grant us unity. Through our Lord Jesus Christ . . .
"Unless we are ready through His power to die in the likeness of His passion, His life is not in us" (St. Ignatius of Antioch). Does anyone know of a website with photos involving the canonization and/or beatification of any of these saints? I will update this post when I find photos by linking the saint's name to my post with the photographs. Below are the canonizations from the pontificates of Pius XI, Pius XII, John XIII, and Paul VI. I would appreciate any suggestions. The following is an excerpt from my upcoming book on exorcism. One chapter of the book is entitled, “Pro-Life and Exorcism” and is devoted to reflecting on the evil of abortion from a spiritual perspective. As a caution for those who may not be accustomed to the language of spiritual warfare, I would mention that the view of abortion contained in the passage below is derived primarily from Jesus’ presentation of the devil as “a murderer from the beginning” (Jn 8:44) and from scriptural passages that identify other demons who collaborate with Satan in his attempt to destroy the very life of God’s children. Make sure to pray as you read this passage. In what sense is abortion demonic? The spiritual dimension of this grisly “business” is its systematizing of ritual blood sacrifice to the god of child murder, Moloch, who we know of from the severe condemnations of him in the Old Testament (Lev 18:21, 20:2-5, 1 Kings 11:5.33, 2 Kings 23:13 and Zephaniah 1:5). This demon of murder appears in many forms and cultures through history (Phoenician, Carthaginian, Canaanite, Celt, Indian, Aztec and others) but is always the same bloodthirsty beast that demands the killing of children as his form of worship. This demon is not content with a single act of murder here and there. His insatiable appetite for the death of innocents seeks public endorsement to justify his gruesome deeds, and he needs a systematic expression of it to increase his worship. The modern abortion industry offers ritual blood sacrifice to the ancient abortion demon. It is in every way a demonic religion. It has its sacred dogma (“choice”), its ruling hierarchy (Planned Parenthood), its theologians (feminist ideologues), its sacrificing priesthood (abortionists), its temples (abortion mills), altars (surgical tables), ritual victims (primarily babies and secondarily women), acolytes and sacristans (clinic workers and death-scorts), congregations (all supporters of abortion) and its own unifying principle of sacramental “grace” (money). In short, the abortion industry is a perfect demonic system which offers a perverse form of worship to the devil. From this perspective, the need for a deeply spiritual approach to ending the abortion holocaust is fundamental. It does not absolve us from working in every way humanly possible to end abortion, but it puts all our human activity into the right perspective. In this month of the Precious Blood we must cover every abortionist, abortion mill and client of the abortion industry with Christ’s Blood in order to conquer the blood sacrifice of the devil with the greatest force of good known to man. If His Blood is properly applied over time with great love, we will see conversions from even the most devoted advocates of abortion. The Blood of Christ is a strong shield for all who pray and work for life and reminds us that our pro-life work brings us to Calvary to stand in solidarity with the unborn child who is unjustly deprived of life. 2nd Update: I still really need prayers for my special intention. Please say a prayer! Also, please pray for the Bryant, who was in a hiking accident. Update: I ask my readers to please continue praying for my special intention. Also, I would like to ask prayers for my family at this time. Thank you and God bless. Original Post: I would like to ask all of my readers to please say a prayer for a special intention of mine. Thank you. Yesterday, after waiting nearly ten weeks, I finally received my custom-made cassock. Today I was able to serve Mass at my parish with both cassock and surplice and am now only server at my parish to wear cassock and surplice. I am very excited and can not recommend The House of Hansen enough. Also, I have not posted on this weblog lately. I have been writing lessons for a popular online Daily Catechism Program. I hope to post a little more on my blog before postings end on August 25, 2007. To the kind readers that sent me donations via Paypal, please accept my sincere thanks! My prayers are with you. If anyone else would like to send me a donation (blogging does take considerable time), I would greatly appreciate it. A link to donate via Paypal is available in the sidebar. On Tuesday, July 11, 2007, the Congregation for the Doctrine of the Faith released a document entitled Responses to Some Questions Regarding Certain Aspects of the Doctrine on the Church, which affirms the primacy of the Catholic Church as the unique Church of Jesus Christ. "The Holy Catholic Church, which is the Mystical Body of Christ, is made up of the faithful who are organically united in the Holy Spirit by the same faith, the same sacraments and the same government." "According to Catholic doctrine, these Communities [protestant denominations] do not enjoy apostolic succession in the sacrament of Orders, and are, therefore, deprived of a constitutive element of the Church. These ecclesial Communities which, specifically because of the absence of the sacramental priesthood, have not preserved the genuine and integral substance of the Eucharistic Mystery cannot, according to Catholic doctrine, be called 'Churches' in the proper sense." "It is possible, according to Catholic doctrine, to affirm correctly that the Church of Christ is present and operative in the churches and ecclesial Communities not yet fully in communion with the Catholic Church, on account of the elements of sanctification and truth that are present in them. Nevertheless, the word “subsists” can only be attributed to the Catholic Church alone precisely because it refers to the mark of unity that we profess in the symbols of the faith (I believe... in the “one” Church); and this “one” Church subsists in the Catholic Church." I encourage all of my readers to read the actual document in its entirety. Let us pray that this document leads to the conversion of non-Catholics. In the words of Pope Innocent III at the Fourth Lateran Council in 1215: "There is but one universal Church of the faithful, outside which no one at all is saved." For more information on the topic of salvation outside of the Church, see my post entitled Can non-Catholics be Saved. Below is an excerpt from a 1938 piece called The Christian Home written by Celestine Strub, OFM. In accordance with the words spoken by God to our first parents, "Increase and multiply and fill the earth," the primary purpose of the family is the propagation of the human race. Now without religion, this purpose will be only imperfectly attained. All history witnesses to the fact that there can be no enduring morality without religion, and the history of the family is no exception to the rule. The suffering and labor, the difficulty and disappointment, the grief and vexation incident to the bearing and rearing of children demand so much patience, love, and self-sacrifice, that no one not imbued with a religious sense of duty and buoyed up by the hope of an eternal reward, will be willing to endure them. Hence where these religious motives are wanting, the primary end of the family will be either wholly or partly neglected, and matrimony degraded to the low level of a selfish partnership or a sinful pastime. We need not have recourse to pagan lands, where infants are deliberately exposed to die, for proof that such is the inevitable result of the absence of religion in the family. The absence or scarcity of children in many families of our own land is sad and sufficient evidence. Nay, even in Christian families, where religion no longer exerts the sway it should, are found those immoral practices that pervert the sublime aim of the family. One might, and in charity one would be bound to, ascribe the absence or scarcity of children in such families to other causes, if wives and mothers did not openly advocate artificial restriction of families on the theory that it is better to have one or two children and bring them up well than to have a larger number and be unable to take proper care of them. That theory in itself, of course, is unassailable so long as no law of God is violated by having only one or two children, and so long as the expression "proper care" is rightly understood. But just the way this theory is understood and put into practice by most of its advocates shows into what errors man falls when he is not restrained by the salutary curb of religion. What is meant by bringing up a child well? From the standpoint of religion, as far as essentials are concerned, it means to bring up a child in such a manner that it will be enabled to attain the end for which God created it--eternal happiness in Heaven. Such an education even the poorest parents will be able to provide for their children, no matter how many they have; and their own happiness in Heaven will be increased by every child that they have added to the number of the elect. There is always a possibility of a child going wrong despite the best parental care; but the probability of its going wrong from neglect because of the large number of children is far less than the probability that it will be spoiled if it is one of a limited few. The very action of the parents in thwarting nature by limiting their offspring will militate against the proper religious training of their children; for it is not likely that parents who themselves disobey the law of God in so grave a matter will be at great pains to rear God-fearing sons and daughters. But even from a material point of view, the assumption is false that parents cannot take proper care of many children. "Proper care" is to be understood relatively, not absolutely; for while parents are bound to provide for the material as well as the spiritual needs of their children, the extent of that provision must vary with the parents' resources. If the best possible training and the best possible care were required for every child, few persons would be allowed to marry at all; since few, if any, could be found whose circumstances could not be improved on. "We are deeply touched by the sufferings of those parents who, in extreme want, experience great difficulty in rearing their children. However, they should take care lest the calamitous state of their external affairs should be the occasion for a much more calamitous error. No difficulty can arise that justifies the putting aside of the law of God which forbids all acts intrinsically evil. There is no possible circumstance in which husband and wife cannot, strengthened by the grace of God, fulfill faithfully their duties and preserve in wedlock their chastity unspotted." I realize most keenly that faithful adherence to the law of God will sometimes require great sacrifices of God-fearing parents. But every state of life, as it confers certain rights and privileges, also demands its peculiar sacrifices; and God will always grant sufficient grace to enable one to make them. If God enables those husbands and wives to keep His holy law who are deprived of the legitimate pleasures of wedlock by the premature death or the life-long illness of their spouses, He will certainly do the same for those whom poverty or other trying conditions place in a similar predicament. With St. Paul, every Christian can say in time of trial: "I can do all things in Him that strengtheneth me." The following example, which is about as extreme a case as one might imagine, shows how God strengthens and consoles those sorely tried consorts who place their trust in Him. I condense the story narrated by the chief actor himself--an English Catholic journalist named W. Gerald Young--in a letter to the London Universe. "Some years ago I stood with a woman at the altar where God united us in the bonds of holy Matrimony. She was all that man could wish for, and, with her, life was a succession of sunny days. More than once did God give her that wonderful blessing of radiant motherhood, and we were intensely happy. Today, however, black clouds of sorrow have overwhelmed us, and we are no longer together. "Once a week I make a pilgrimage into the beautiful hill country of Surrey, where there is an institution known by the name of a mental hospital. Here it is that my dear one spends her days,--long, weary days, because she is mad. Here is my shrine. Frail and pallid, she lies on a bed, dead to the world of intelligence. Her once beautiful face is now disfigured; her old-time smile superseded by a scowl. When I kiss her dear lips, there is no warm response from the woman who loved me so dearly; and yet she still holds the keys of my heart. "My journey back to London is a weary one; for how can we call it home when the wife and mother is absent? Little voices will ask when Mama is coming back, and Daddy cannot tell them. On my way back, I visit a little church wherein the Blessed Sacrament is always exposed for adoration. In this haven of rest where all is quiet and peaceful, I lift up my weary heart to God and tell Him my troubles, and I come out a happier man, because I have unburdened my soul to my Maker and He has given me new courage to fight this weary battle of life. Some day God may see fit to answer my petition. In the meantime I can only hope and pray." But whether God grants this brave man's prayer here on earth or not, oh, how magnificently will He reward his fidelity in eternity! Now if a man can be faithful to the law of God in such trying circumstances, how much easier should it be for those whose happy homes are still unbroken and who need only practice Christian self-restraint? The whole argument against large families only shows the absence of the salutary restraints of religion. At bottom it is not the desire to give their children a more excellent training but the desire to lead a more selfish and comfortable life that clamors for the unnatural limitation of the family. No one is more desirous of having well-trained children than deeply religious parents; but such parents, regarding their office in the light of Faith, are bent mainly on rearing their children for Heaven; and they understand that, even should they be able to provide them but scantily with the goods of this world, by training them for Heaven the main thing is achieved and their principal duty performed. They realize, too, that the success of all their efforts in behalf of their children depends mainly on Heaven's blessing, and that if they merit that blessing by their upright lives, He who feeds the birds of the air and clothes the lilies of the field will also provide for their children. Happy the parents who still retain this religious outlook on life; whose religion is their guide, their support, and their consolation amid the arduous duties of their state of life! They know that they are the chosen instruments of Divine Providence for peopling the abode of the blessed. They know that in assuming the office of parenthood, they cooperate with God himself in bringing into existence beings destined to praise and enjoy him forever in Heaven. They know that every child they receive is a gift of God; since, do what they will, they can have no child that God does not give them. But above the solace of all this knowledge, is the supernatural aid which the true religion affords them. 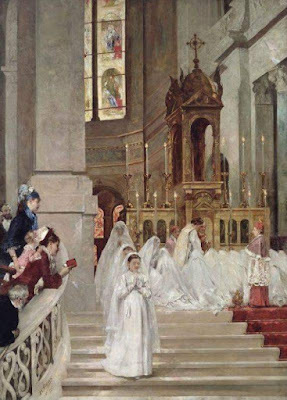 They have the actual graces of the sacrament of Matrimony, of frequent Communion, and of daily prayer to strengthen them, and the example of their suffering Savior to console them. Yes, with religion in their homes, they can resist the evil example of those godless couples who seek only their own gratification. And though eugenic wise-acres scoff, and even misguided friends smile in derision at their old-fashioned families, they will never thwart Heaven's designs concerning their families, but look upon every child as a new token of Heaven's trust and Heaven's love. It is remarkable how often God rewards parents of large families by making the children that came last become the chief joy and pride of their life. The Little Flower of Jesus was the last of nine children; St. Ignatius of Loyola, the thirteenth and St. Catherine of Siena, the twenty-fourth or twenty-fifth. Many parents owe the honor of having a son raised to the priesthood to the fact that they had large families. Had my own parents been willing to have five children but no more, they would never have had a priest in the family. But because they were blessed with eight children, they had the happiness of seeing the sixth and seventh celebrate their first Mass on the same day; and though they have gone to their reward, they are no doubt happy to know that two sons of their eighth child are studying for the priesthood. A few years ago, I received a letter from a young mother of two children, in which she related how certain worldly-wise women try to induce mothers to limit the number of their children. On the occasion of a social call, a lady acquaintance of hers had remarked: "It is not a woman of refinement nowadays that has more than two children." To which the young mother replied: "In that case I hope to belong to the common herd, as I intend to take all that the good Lord wants to give me." In replying to her letter, I commended her for her truly Catholic stand, and then added: "I thank God that my own good mother did not have such a false idea of refinement; for if she had, I should have had no chance at all, as I was her seventh child." And the very first time I related this incident, namely, to a group of Franciscan Fathers at St. Elizabeth's Friary, Denver, Colo., each one of the five priests present declared that he, too, was his mother's seventh child! Necessary as religion is in the home for the attainment of the primary aim of marriage and the family--the propagation of the human race, it is equally necessary for the attainment of the family's final aim--the education of children for Heaven. Above all else it is the soul of the child for which parents will have to render a strict account on the day of judgment; and it is the religious and moral training of their children, therefore, that constitutes their paramount duty to their offspring. When Catholic parents stand before their Divine Judge, they will not be asked whether they did their utmost to enable their children to prosper in this world--to wear the laurels of its honors, to reap the fruits of its riches, and to quaff the wine of its sensual pleasures. No; the question they will have to answer is, whether they did their duty in enabling their children not only to save their immortal souls, but also to reach that degree of holiness to which God destined them and to embrace that state of life in which God wished them to serve Him. To acquit themselves of this sacred duty, parents must needs foster religion in their home. If religion is to be planted deep in the heart of the child,--so deep that it will defy all later attempts of the world, the flesh and the devil, to root it out, it will not do to defer the child's religious education until it starts to school. Its religious education must be begun not only at the first dawn of reason, but long before the dawn of reason--in very infancy, so that a truly religious mind will be developed and become a veritable second nature. It follows necessarily, then, that religion must exert the dominant influence in the place where the child's first years are spent; namely, in the home. Religion should surround the child as snugly as its infant clothing. The child should imbibe religion at its mother's breast. It should be rocked to sleep to the tune of religion, and its first lisping accents should have a religious character. Only if religion rules the home, will the child get the impression right at the start that religion is the most important thing in life. If there is little or no religion in the home, the child will naturally be led to suppose that wealth and position, secular knowledge and training, or even worldly comforts and pleasures are the things most worth while; and that religion, instead of being a vital force in life, is merely a polite concession that man feels he must occasionally make to God, his Creator; and hence that it is, like a badge or his best clothes,--to be displayed only in church and on special occasions. Few parents who send their children to a Catholic school will deny the necessity of religion in the school. They know that even if a school should be entirely non-sectarian and in no way opposed to religion, the mere absence of religion would itself be a great evil; for, if education means the training and instructing of a child for the performance of the duties of life, it must needs embrace religious training and instruction, since the practice of religion is the first and foremost of life's duties. Now what is true of the absence of religion in the school, is equally true of its absence in the home. The supernatural graces which the child received in Baptism, sanctifying grace and the infused virtues of Faith, Hope, and Charity, are awaiting nourishment and warmth in order to blossom forth and yield fruit; and to deny the child the religious food and atmosphere it craves is to stunt if not to thwart its spiritual growth. To say that no harm is done the child so long as it is taught nothing positively bad or irreligious, is just as false as to say that it will not harm a child to deprive it of food so long as you do not give it poison. Yet great as is the need of religion in the home for the proper molding of the infant mind and heart, how frequently is the hungry little soul of the child practically starved until it begins to attend a Catholic school! How often, too, is it not taught things that are positively bad either by word or by example! How often are not things said or done or permitted in the presence of children and justified or excused with the remark that "they don't know what it means," or "it won't do them any harm"! It may do them incalculable harm. It is just this seed sown in the innocent child's memory and imagination, from which later on evil will spring; and then the astonished parents wonder where the child learnt it. Small children are the most impressionable beings in the world, and the impressions which they receive are the ones that sink deepest and that will leave their traces all through life. One reason why the child's religious education is often neglected at home, is the tendency on the part of parents to disemburden themselves of the duty of educating their children by committing that task entirely to others. The Catholic parochial school is unquestionably a splendid as well as a necessary institution; but it must be remembered that the education of children is in the first place the duty of the parents, and that the purpose of the school is only to co-operate with the parents, and in particular to take up the work at that point where the parents are no longer able to accomplish it satisfactorily themselves. That point, I am inclined to think, is ordinarily not reached before the child completes its sixth year, since there are few parents who are unable, from lack of either time or knowledge, to teach their children all they need to know on entering the first grade. There is, however, a growing custom of anticipating that point by entrusting the child to others when it is only five, or even only three or four years old; and the cause of the custom is the existence of the kindergarten. "We wish to call your attention in a special manner to the present-day lamentable decline in family education. The offices and professions of a transitory and earthly life, which are certainly of far less importance, are prepared for by long and careful study; whereas for the fundamental duty and obligation of educating their children, many parents have little or no preparation, immersed as they are in temporal cares. "The declining influence of domestic environment is further weakened by another tendency prevalent almost everywhere to-day, which, under one pretext or another, for economic reasons, or for reasons of industry, trade or politics, causes children to be more and more frequently sent away from home even in their tenderest years." --Pius XI in "Christian Education of Youth." Yet it is not so much duty, young mothers, that I would emphasize, as love, to induce you to make the early education of your children your own personal task. Soon enough, yes all too soon the time will come when your darlings will pass from the sacred sanctuary of your home to spend the greater part of their waking hours elsewhere. Should your mother's love not be anxious to have them under your watchful eye as long as possible? During those first half dozen years, when the child's heart can be molded like soft clay, should you not desire to fashion it to the highest ideals with your own loving hands? Should you not wish to be able to say that those essential prayers, which you expect your children to recite daily through life, were first learned and lisped at their mother's knee? Should you not aim to bind them to their home by the strongest ties of interest as well as of affection? If so, then the surest way is to make the home the fountain at which they first drink the waters of wisdom; to make the home the attractive center of all their earthly hopes and joys and the holy shrine round which will caressingly cling the fondest of all the happy memories of childhood. But even when parents have done all in their power for the religious education of their children before the latter begin to attend school, let them not imagine that their task is accomplished. When they finally commit them to the charge of others, at the proper age, they do not thereby divest themselves of all responsibility, but must co-operate with the teachers by their interest, their discipline, and their moral support. (See Holy Father's quotation below.) Here again appears the necessity of religion in the home. If the child learns at school that it is in this world to serve God and to save its immortal soul, and that the things of earth are to be used merely as means to that end, that lesson must have an echo in the home. What the school emphasizes as the most important thing in life must likewise be regarded as such in the home. It will not do for the child to find a disagreement between the religious truths it learns at school and the views it hears expressed and defended at home. The irreconcilable opposition between the maxims of Christ and the maxims of this world will come home to the child soon enough; and if the former are to take root in its heart as they should, the seed sown in religious instruction in school must be nurtured by religion in the home. It is true, the child will come in touch with irreligion sooner or later outside the circle of the home and school; but that is not likely to affect it so easily, since it has been taught to look upon the world as hostile to its own best interests. It will be quite different if irreligion is met with in the home. A child implicitly trusts its parents. It believes that they have its welfare at heart; and it will be confronted with a puzzling contradiction if its parents by word, deed, or omission countenance or counsel anything that it was taught at school to regard as wrong. Just because of its confidence in its parents, the child is more likely to follow the example of the home than the precept it learned at school. Example is always more powerful than precept; and it is of the highest importance, therefore, that the religious instruction of the school be seconded by the example of sterling Christian conduct in the home. Only when home and school work hand in hand, mutually supporting, complementing, and encouraging each other, may we hope that our children will receive the kind of education that will enable them to bring forth the fruits of a truly Christian life. "Since, however, the younger generations must be trained in the arts and sciences for the advantage and prosperity of civil society, and since the family of itself is unequal to this task, it was necessary to create that social institution, the school. But let it be borne in mind that this institution owes its existence to the initiative of the family and of the Church, long before it was undertaken by the State. Hence, considered in its historical origin, the school is by its very nature and institution subsidiary and complementary to the family and the Church. It follows logically and necessarily that it must not be in opposition to, but in positive accord with those other two elements, and form with them a perfect moral union, constituting one sanctuary of education, as it were, with the family and the Church. Otherwise it is doomed to fail of its purpose and to become instead an agent of destruction." --Encyclical on "Christian Education of Youth." The very fact that the school is supposed to continue the education of the home and that both must be pervaded by the same Christian spirit, shows the obligation that Catholic parents are under of placing their children only in a Catholic school. In his encyclical on the Christian Education of Youth, Pope Pius XI emphasizes this duty in unmistakable terms "There is no need," he writes, "to repeat what Our predecessors have declared on this point, especially Pius IX and Leo XIII.... We renew and confirm their declarations, as well as the sacred Canons, in which the frequenting of non-Catholic schools, whether neutral or mixed, those namely which are open to Catholics and non-Catholics alike, is forbidden for Catholic children, and can be at most tolerated, on the approval of the Ordinary alone, under determined circumstances of place and time, and with special precautions. "Neither can Catholics admit that other type of mixed school...in which the students are provided with separate religious instruction, but receive other lessons in common with non-Catholic pupils from non-Catholic teachers. For the mere fact that a school gives some religious instructions (often extremely stinted) does not bring it into accord with the rights of the Church and of the Christian family, or make it a fit place for Catholic students. "To be that, it is necessary that all the teaching and the whole organization of the school, its teachers, syllabus, and textbooks in every branch be regulated by the Christian spirit, under the direction and maternal supervision of the Church; so that religion may be in very truth the foundation and crown of the youth's entire training; and this in every grade of school, not only the elementary, but the intermediate and the higher institutions of learning as well. To use the words of Leo XIII: 'It is necessary not only that religious instruction be given to the young at certain fixed times, but also that every other subject taught be permeated with Christian piety. If this is wanting, if this sacred atmosphere does not pervade and warm the hearts of masters and scholars alike, little good can be expected from any kind of learning, and considerable harm will often be the consequence.'" It is true, indeed, that Catholics who have had the very best religious schooling and come from the finest Catholic families sometimes fail nevertheless to turn out well; but that is certainly not because of, but despite, their religious education. Such cases, too, are relatively rare; and I think that on investigation it would be found that most of them were thrown too suddenly upon the world, or passed at too early an age beyond the sustaining and restraining influence of Christian surroundings. The great majority of men stand in need of the support and encouragement of a good example throughout their entire life; and as they cannot find this encouragement amid the hustle and bustle of the world, they must find it in their homes. It is not enough, then, that the child have the advantage of an early religious home training. The steadying influence of religion in the home must continue all through life. This phase of our subject, the necessity of religion in the home also for the children that have graduated from school and for the grown-up members of the family, ought perhaps to be emphasized most, because it is so commonly disregarded. It is with religion as with all other things that influence our lives: it must be fostered if its influence is to last; and once the child is beyond the school age, there is great danger that it will gradually limit its religious practice to the hour in church on Sundays, if a truly Christian home life does not continue the beneficial religious influence previously exerted by the Catholic school. The home is really the only place, besides the church, that can be made to conform to one's daily religious needs; and it is here, therefore, that one must provide what cannot be had abroad. If abroad, amid the enforced companionship of unbelieving fellow-workmen, it is not always possible to avoid hearing one's religion set at naught and ridiculed, in the home one can insist that it be held in honor and esteemed the most vital thing on earth. If abroad the open practice of any act of religion would ordinarily be viewed with silent wonder or unconcealed contempt, in the home the act of folding the hands or kneeling to pray must be regarded as natural as eating and drinking. If abroad one is often powerless to prevent irreligion and immorality from having access to the press, bill-boards, art galleries and places of amusement, one can at least refuse admission to them when they knock on the door of our Christian homes. Give me truly Christian homes, homes in which Christianity is not merely tolerated but revered and fostered, and homes that are homes and not only sleeping quarters, and I will give you a race of Christian men and women who will cling to their Faith despite the insidious machinations of a corrupt and irreligious world. Preface: All Scripture quotations are from the Douay-Rheims Bible , the English translation of the Latin Vulgate. I am certain that this post will undoubtedly be controversial again; however, I write this post simply to help restore needed reverence to our Eucharistic Lord. For that reason, I support whatever the Holy Catholic Church infallibly teaches, but I am free to disagree with any non-infallible practices. The fight to restore Eucharistic Reverence has caused debates, arguments, and even violence at various times in history. Jesus even referred to himself as a cause of division (Matthew 10:34), and because of the division, his servants will undoubtedly suffer persecution (Matthew 10:22). I pray that this post will help discourage the practice of Communion in the Hand, encourage reception of the Eucharist on the Tongue, and help discourage the practice of extraordinary ministers of Holy Communion. First and foremost, for non-Catholics reading this post, please first read my post on The Eucharist to understand its significance. As affirmed at various points in history, at several Councils (ex. Council of Trent's Thirteenth Session; Vatican II's Sacrosanctum Concilium 7), in the Catechism of the Catholic Church (ex. CCC 1373-1374, 1413), in the words of countless saints, and in the words of Christ Himself (Mt 26:26-28; cf. Mk 14:22-24, Lk 22:17-20, 1 Cor 11:23-25), the Eucharist - Holy Communion - is truly the Real Presence of Jesus Christ. It is not a metaphoric representation of Jesus - the Eucharist is Jesus Christ. Consequently, the Eucharist deserves the greatest degree of worship. Simply, Communion in the Hand is a practice that I do not support because it is a sacrilege; I only receive Holy Communion on the tongue. Through Communion in the Hand, it is far easier for particles of the Eucharist to fall to the ground. Such particles are still completely Christ (Council of Trent, Thirteenth Session, Canon 4)! According to J Bona in a 3-volume work entitled Rerum Liturgicarum (1747 AD) Communion in the hand most likely ceased before Pope St. Gregory the Great (d. 604). Even though Communion in the hand may have been allowed at some points in the early Church, it is not appropriate for our current era when irreverence and a lack of belief in the Real Presence is spreading. Spain forbid it completely in the 400s and said that anyone who would stand and receive would receive excommunication. According to a Gallup Poll of 519 American Catholics, 18 years or older, conducted from December 10, 1991, to January 19, 1992, only 30% believe that they receive in Holy Communion the Body, Blood, Soul, and Divinity of Jesus Christ! This is shocking! 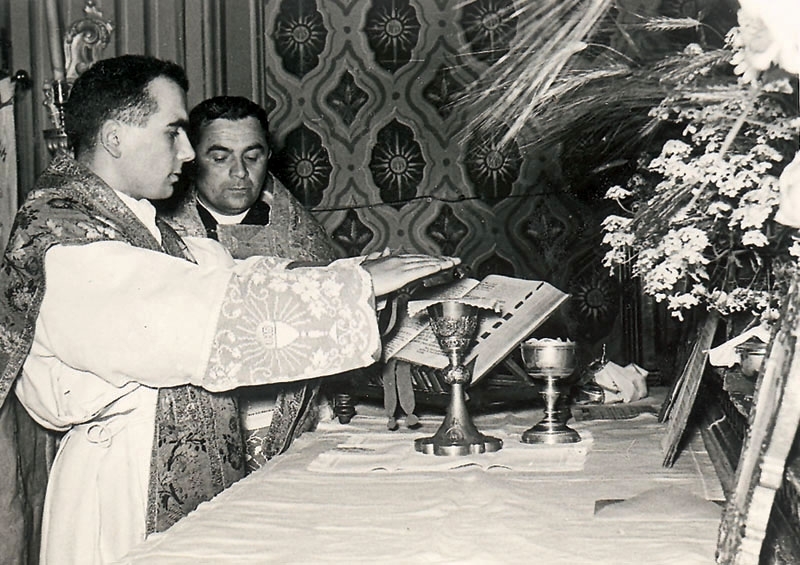 By receiving Holy Communion on the Tongue, non-Catholics see Catholics professing the Faith in a unique and truly profound manner. Such a manner ensures that observers as well as Catholic understand they are not receiving ordinary bread. According to statistics from the article Index of Catholicism's Decline, by Pat Buchanan, who cites Kenneth C. Jones's Index of Leading Catholic Indicators: The Church Since Vatican II, a shocking number - 70% - of Catholics between the ages of 18-44 do not believe in the Real Presence! We must work to increase belief and devotion to our Eucharistic Lord!! The same statistics illustrate annulments increased from 338 in 1968 to 50,000 in 2002. Also, teaching nuns, ordinations, seminarians, and Catholic marriages all declined. Let us work to counter these alarming statistics. Below are the words of several saints and Church figures on the practice of Communion in the Hand. I pray that if you have been receiving Communion in the Hand, you will begin to receive our Lord exclusively on the tongue. Holy Scripture: In the Old Testament, it is recorded that only Levite priests were allowed to carry the Ark of the Covenent (1 Chronicles 13:2), and when a non-Levite priest touched the Ark of the Covenent he was struck dead (1 Chronicles 13:9). Today the Holy Eucharist is the Holy of Holiess, and only those who have been consecrated to touch the Eucharist (Summa, Pt III Q, Q2 Art. 3) should touch it. A change in a matter of such moment, based on a most ancient and venerable tradition, does not merely affect discipline. 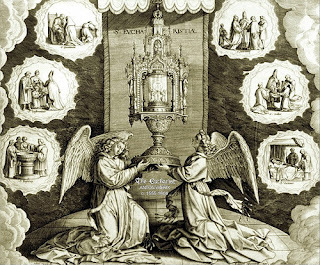 It carries certain dangers with it which may arise from the new manner of administering holy communion: the danger of a loss of reverence for the august sacrament of the altar, of profanation, of adulterating the true doctrine. When the wife of the President of France, Madame Giscard d'Estaing came before the Holy Father with outstretched hands, Pope John Paul II placed the host in her mouth. (Homiletic & Pastoral Review, March 1997 pg 24). He did likewise for a canon lawyer who was present at the 1981 Papal Mass in Chicago. Pope John Paul II wrote, "To touch the sacred species and to distribute them with their own hands is a privilege of the ordained, one which indicates an active participation in the ministry of the Eucharist. It is obvious that the Church can grant this faculty to those who are neither priests nor deacons, as is the case with acolytes in the exercise of their ministry, especially if they are destined for future ordination, or with other lay people who are chosen for this to meet a just need, but always after an adequate preparation." (Dominicae Cenae , 1980, end of paragraph 11). Thus, Pope John Paul II is acknowledging laypeople may touch the Holy Eucharist in a situation of "just need" but only after "adequate preparation". Yet, he does start by affirming that the distribution of Holy Communion is reserved principally to the ordained. However, as I discuss below under the topic of extraordinary ministers, there is usually not a "just need" to warrant the use of extraordinary ministers. Blessed Mother Teresa: Blessed Mother Teresa said, "Further it is the custom in our Society, and my known wish, that the Sisters receive Holy Communion on the tongue, which to my knowledge they are doing everywhere" (Mother Theresa, India 1995; Athi Thoothan Editor, Aquinas, p. 13, Vol 2, No 1 March 2000). "Not very long ago I said Mass and preached for their Mother, Mother Teresa of Calcutta, and after breakfast we spent quite a long time talking in a little room. Suddenly, I found myself asking her -- don't know why -- 'Mother, what do you think is the worst problem in the world today?' She more than anyone could name any number of candidates: famine, plague, disease, the breakdown of the family, rebellion against God, the corruption of the media, world debt, nuclear threat, and so on. "Without pausing a second she said, 'Wherever I go in the whole world, the thing that makes me the saddest is watching people receive Communion in the hand.'" 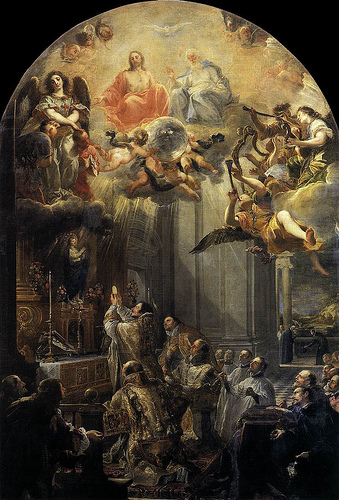 Council of Saragozza (380 AD) and of Toledo (400 AD): Declared that the Eucharist host must be consumed before the communicant left the Church. It was a practice in the early Church to have Holy Communion taken to the sick, but the practice was corrected because of the abuses that resulted from it. Similarly, abuses are occuring to the Holy Eucharist. Council of Rouen (650 AD): "Do not put the Eucharist in the hands of any layperson, but only in their mouths"
Council of Constantinople (695 AD): The council prohibited the faithful from giving Communion to themelves. It decreed an excommunication of one week's duration for those who would do so in the presence of a bishop, priest or deacon. "In Christ, now, there is no suffering, but only in the Mystical Body. But there is one place, which I would like to address this morning, where I believe that Our Lord is truly grieved. I want to challenge you in that area: That is, the manner by which we receive Holy Communion. "The Church is very clear in Her documents that she desires that we would receive Holy Communion on the tongue and not in the hand. "The bishops of America, as well as a few other countries in the world, have allowed Communion in the hand as a dispensation. But the Church is very, very clear that She does not want us receiving Communion in the hand. "Let me explain a little as to why. First of all, to receive is something that is passive. The priest takes Holy Communion because the priest is the one who offers the Victim in sacrifice. Therefore, the one who offers the Victim must also take part in that Victim. But the people of God are to receive Holy Communion. To take the Host from your hand and put It into your own mouth is to take Communion, not to receive Communion; and so it is an active thing, not a passive thing. The Lord desires to give Himself to you as a gift, not to be taken by you. We need to be very careful that we do not lose the symbolism of what is happening in the Blessed Sacrament. "Also, if you will notice, during Mass after the Consecration, my fingers remain together because of the particles of the Host that are there. When we take Holy Communion in the hand, there are particles of Our Lord that are on our hands and on our fingers. That is why, after Communion, the priest will purify his fingers - because of the particles of the Host. But how often the people of God, after receiving Holy Communion, simply brush the particles onto the ground and walk on Our Lord. Or they put their hands in their pockets, and Our Lord is right there on their clothing. The abuses that this opens them up to are very grave. Not that anyone is intentionally doing that, but I think it is something that we need to consider exceedingly carefully. "What I always tell people is that you can look forward to the Day of Judgment and ask yourself how you intend to approach Our Lord, because He is your Judge. The same Lord you approach in Holy Communion is the same One you will approach on the Day of Judgment. Do you assume that you will put your hand out to Our Blessed Lord on the Day of Judgment? "Is your view of judgment that you will shake Our Lord's hand and tell Him how wonderful it is to see Him? Or is your view that you will do great reverence to Our Blessed Lord? My view is that I will be flat on my face - not shaking His hand. "We do not put out our hand to God. Scripture says that God holds us in the palm of His hand. We should not be holding God in the palm of ours. He created us; He made us in His image and likeness. He is the Creator; we are the creature. We must approach Him with the greatest reverence, the greatest respect. "If we simply look at the fruit that has been borne by Holy Communion being taken in the hand, it is not good: the loss of reverence for the Blessed Sacrament, the familiarity. "Thankfully it is not happening here, but go to most churches and ask yourself if you see people praying before Mass or if they are chatting, goofing around, and talking. "We have lost the reverence for the Real Presence because Jesus is just "our buddy" when we put our hand out to Him; He is not our God when we do that. So we need to be very careful. "But beyond that, we can look also at what has happened spiritually to the people of God. Since we have been receiving Communion in the hand, we have lost sight of the idea of going to Confession, of our own sinfulness, of the reverence we must have for Our Lord. We have made Communion so easy a thing and so nonchalant a thing that people have lost that sense of reverence, of awe, and of respect in the Presence of Our Lord. "I challenge you to think very seriously about this issue. The bishops, like I say, have allowed it; it is not a sin if you receive Holy Communion in the hand. In some places in the early Church they did that; Saint Justin talks about it. 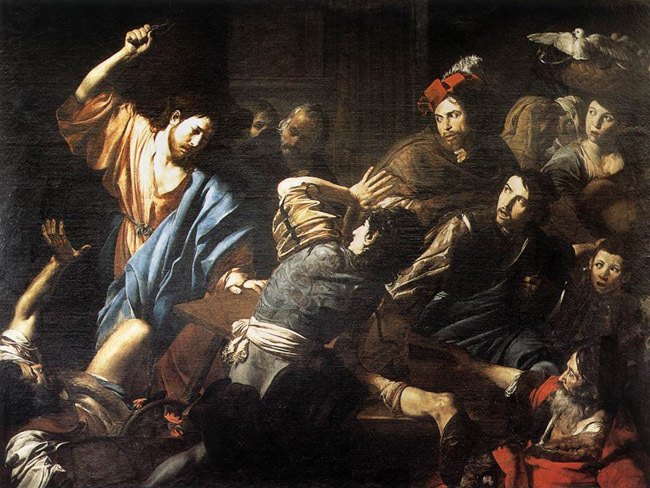 But the Church stopped it because of the abuses against the Blessed Sacrament that were occurring. I ask you to really pray about that. "Look at Jesus in the Eucharist and ask yourself, "Do I really, truly believe that this is God? That this is my Creator and my Redeemer? How, then, do I desire to approach Him?" I really believe, if you pray that through, that there is only one conclusion to which you can come. "Then, I beg you, do not remain silent about it. Tell your friends. Tell your family. Bring that word to others because all those good people out there, I do not think that they are willfully trying to do anything that would grieve Our Lord; they are doing what they have been told to do. "But again, look at what has happened in the last forty years of this particular practice and ask yourself if the fruit it has borne has been good. Obviously, you love Our Lord: You are here at daily Mass; you are here every morning. The love of Our Lord is evident in you. Bring that love of Jesus out from here. The love that is in your heart, proclaim it to others and ask them in the same way to consider their actions toward Our Lord. "Let us bring the reverence to Our Lord in the Blessed Sacrament back so that we can give Him fitting worship and praise because He is God, in whom all the treasures of wisdom and knowledge are contained." "...when the faithful themselves receive Communion, they receive It kneeling at the altar rail, and directly onto their tongue. This is very significant. Receiving Communion whilst kneeling means that the faithful line up in a row before the sanctuary, and thus have time to prepare themselves for this most sacred of events: coming into spiritual and substantial union with Christ Himself. The communicant kneels down, and whilst he waits for the priest to make his way around, he can settle himself, concentrate on the upcoming Communion with our Lord praying intensely. When it is his turn, the priest says the prayer: "May the body of Our Lord Jesus Christ keep your soul until life everlasting. Amen". This means, besides the beauty and the significance of the words themselves, that the priest says the word "Amen" so that the communicant need not invoke his voice to receive the King of Kings, allowing a constant stream of prayer and thanksgiving to flow from soul to Saviour. The communicant simply needs to expose his tongue, and his side of the proceedings is complete. Upon receiving Christ, he can continue praying for a little while, and only then does he need to return to his seat, leaving room for the next communicant. Moreover, having the priest come over to the communicant signifies that Christ comes to us, feeds us with His own divine life, whilst we wait kneeling and unmoving like little children totally dependent on His love, mercy and compassion. This is the message of the Gospel: to become like little children, submitting our wills to His and depending totally on Him for everything. We cannot even feed ourselves without Christ's help, and the action of Communion in the traditional manner demonstrates this in a very vivid manner." For more on this topic, I would like to highly recommend "Dominus Est - It is the Lord" by His Excellency Athanasius Schneider on this very topic. Connected with the topic of Communion in the Hand is the use of Extraordinary Ministers of Holy Communion. While I used to serve in this "ministry" I am glad to have resigned after receiving a few emails from readers and reading the above writings. It remains clear that only the hands of the priest or deacon are consecrated to touch the Holy Eucharist (St. Thomas Aquinas). Traditionally, lay people including altar servers were also forbidden to touch the sacred vessels including the Chalice. If they had to touch the paten they would hold it with a purificator. Likewise, they were only to carry the Chalice by touching the chalice veil covering it. They could absolutely never touch the precious metal of the Chalice. It is still a pious practice and one that I support. For the most part, the practice of extraordinary ministers has grown into a liturgical abuse. As stated in INSTRUCTION ON CERTAIN QUESTIONS REGARDING THE COLLABORATION OF THE NON-ORDAINED FAITHFUL IN THE SACRED MINISTRY OF PRIEST, "Extraordinary ministers may distribute Holy Communion at Eucharistic celebrations only when there are no ordained ministers present or when those ordained ministers present at a liturgical celebration are truly unable to distribute Holy Communion (99). They may also exercise this function at Eucharistic celebrations where there are particularly large numbers of the faithful and which would be excessively prolonged because of an insufficient number of ordained ministers to distribute Holy Communion" (100). A similar statement can be found in GIRM 162. However, nearly all Catholic churches see an "army" of extraordinary ministers at Sunday Mass when they are gravely unnecessary. 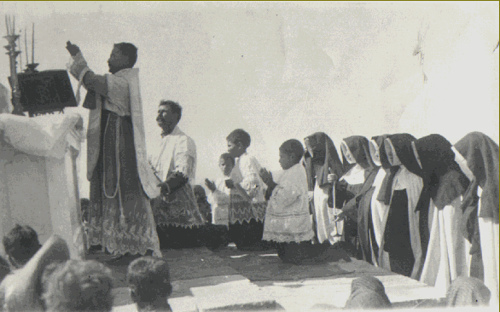 As in the pre-Vatican II era, the priest today could easily distribute Holy Communion to a large congregation. The additional time in the distribution of Holy Communion would be beneficial for the Faithful since they could kneel longer in contemplation and thanksgiving for receiving the true Body and Blood of Jesus Christ. The sanctuary remains the location of the Holy of Holies - God himself. Too often people wearing jeans, shorts, or even strap-less shirts are allowed into the sanctuary nowadays. The loss of reverence to the Eucharistic Lord is at an all-time high. Only ordained ministers and altar servers should enter the Sanctuary. I never encourage the use of extraordinary ministers of Holy Communion, and I hope that the ministry will eventually be ended by the Church. Already many of these people incorrectly refer to themselves as "Eucharistic ministers," “Special ministers of Holy Communion,” and “extraordinary ministers of the Eucharist” in violation of paragraphs 154-156 of Redemptionis Sacramentum. Please, if you are an extraordinary minister of Holy Communion, I suggest that you to resign from the ministry as I previously did. In the writings of many of the saints, it is clear that the practice of the laity touching the Eucharist with their hands should never be encouraged unless necessity requires it. Before I discuss the use of altar rails, I would first like to encourage the practice of genuflection. Most people still genuflect, however, few people bow their head at the necessary times during prayer at the Holy Sacrifice of the Mass. I strongly encourage my readers to look at my post On Genuflecting and Bowing for more information. 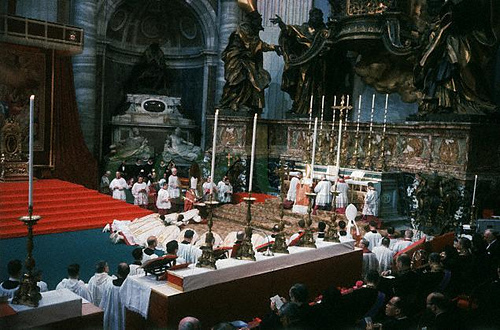 Concerning Communion Rails, Institutio Generalis Romani Missalis 2000, the most recent document by the Vatican on the matter, states that there is no requirement in liturgical law necessitating the removal of altar rails from historic churches and nothing prohibiting their erection in new ones. Fr. Edward McNamara, professor of liturgy at the Regina Apostolorum Pontifical University, states: "...no document explicitly mandates or even suggests that the removal of altar rails is required by the liturgical reform". For those reasons I hope and pray that more churches bring back altar rails. Following Vatican II, many churches destroyed beautiful marble, hand-carved altar rails. Altar rails are gravely important because they allow more of the Faithful to receive the Holy Eucharist on the tongue while kneeling. Thankfully Catholic Church and chapels that offer the Tridentine Latin Mass are some of the places where the use of altar rails has been retained. If you have any comments or suggestions on this post, I highly welcome comments below. I am going to add this post in my sidebar links and keep it as a reference. I will certainly edit this in the future with more topics that coincide with the Mission to Restore Eucharistic Reverence. Again, I pray that this post will not be a source of controversy and discord but one filled with ideas on how to encourage Eucharistic Reverence. The Motu Proprio is Published! So, if you want to have a Tridentine Latin Mass in your area, please ask your priest as soon as possible! This is one of the greatest days for the Church in years!!!! Let us pray the Te Deum in thanksgiving! I pray that I might one day offer the extraordinary rite, the Tridentine Latin Mass. Art. 1 The Roman Missal promulgated by Paul VI is the ordinary expression of the Lex orandi (Law of prayer) of the Catholic Church of the Latin rite. Nonetheless, the Roman Missal promulgated by St. Pius V and reissued by Bl. 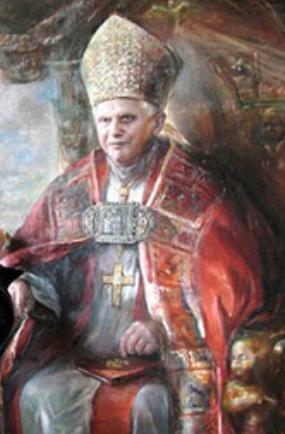 John XXIII is to be considered as an extraordinary expression of that same Lex orandi, and must be given due honour for its venerable and ancient usage. These two expressions of the Church’s Lex orandi will in no any way lead to a division in the Church’s Lex credendi (Law of belief). They are, in fact two usages of the one Roman rite. Art. 3 Communities of Institutes of consecrated life and of Societies of apostolic life, of either pontifical or diocesan right, wishing to celebrate Mass in accordance with the edition of the Roman Missal promulgated in 1962, for conventual or “community” celebration in their oratories, may do so. If an individual community or an entire Institute or Society wishes to undertake such celebrations often, habitually or permanently, the decision must be taken by the Superiors Major, in accordance with the law and following their own specific decrees and statues. Art. 5 § 1 In parishes, where there is a stable group of faithful who adhere to the earlier liturgical tradition, the pastor should willingly accept their requests to celebrate the Mass according to the rite of the Roman Missal published in 1962, and ensure that the welfare of these faithful harmonises with the ordinary pastoral care of the parish, under the guidance of the bishop in accordance with canon 392, avoiding discord and favouring the unity of the whole Church. Art. 7 If a group of lay faithful, as mentioned in art. 5 § 1, has not obtained satisfaction to their requests from the pastor, they should inform the diocesan bishop. The bishop is strongly requested to satisfy their wishes. If he cannot arrange for such celebration to take place, the matter should be referred to the Pontifical Commission “Ecclesia Dei”. 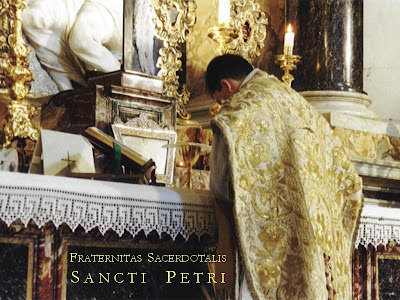 § 2 Clerics ordained “in sacris constitutis” may use the Roman Breviary promulgated by Bl. 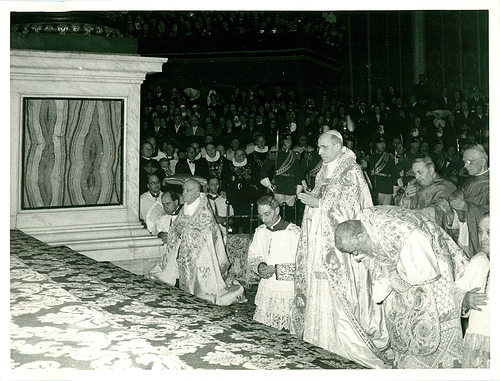 John XXIII in 1962. Art. 10 The ordinary of a particular place, if he feels it appropriate, may erect a personal parish in accordance with can. 518 for celebrations following the ancient form of the Roman rite, or appoint a chaplain, while observing all the norms of law. Art. 11 The Pontifical Commission “Ecclesia Dei”, erected by John Paul II in 1988, continues to exercise its function. Said Commission will have the form, duties and norms that the Roman Pontiff wishes to assign it. "It is, therefore, permissible to celebrate the Sacrifice of the Mass following the typical edition of the Roman Missal promulgated by Bl. John XXIII in 1962 and never abrogated, as an extraordinary form of the Liturgy of the Church"
Fr. Z at What Does the Prayer Really Say? Since my previous post on this topic led to a debate with a lack of charity on both sides, I have deleted the post and replaced it with this revised one. The Holy Father appointed Fr. Peter F. Christensen of the clergy of the archdiocese of Saint Paul and Minneapolis, U.S.A., pastor of the parish of the Nativity of Our Lord, as bishop of Superior (area 40,701, population 443,209, Catholics 81,885, priests 71, permanent deacons 57, religious 104), U.S.A. The bishop-elect was born in Pasadena, U.S.A., in 1952 and ordained a priest in 1985. He succeeds Bishop Raphael Michael Fliss, whose resignation from the pastoral care of the same diocese, the Holy Father accepted, upon having reached the age limit. Please pray for Fr. Peter F. Christensen.